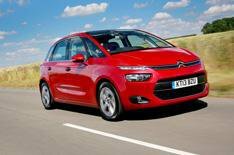 2013 Citroen C4 Picasso goes on sale | What Car? The five-seat Citroen C4 Picasso is now available in the UK, with prices starting at 17,500. It is available in four trims VTR, VTR+, Exclusive and Exclusive+. There are five engines on offer two petrols and three diesels. The 17,500 entry-level price brings the petrol VTi model in VTR trim with a manual gearbox, while the top-level 24,455 price brings the Exclusive+ e-HDi 115 with the ETG6 automatic 'box. VTR trim includes Bluetooth, a seven-inch colour screen, keyless start, cruise control, three separate rear seats that recline independently, dual-zone air-conditioning and 16-inch alloys. While this entry-level C4 Picasso is 1655 less than the cheapest Renault Scenic, that car comes with more kit, such as sat-nav and automatic lights and wipers. C4 Picasso buyers who want auto lights and wipers need to upgrade to VTR+ trim, where you also get digital air-conditioning, a flat folding front seat, underfloor storage in row two, DAB radio and rear parking sensors. Satellite-navigation is not offered as standard until Exclusive trim, which also adds a larger, 12-inch HD screen, cornering lights, kerb lighting in the door mirrors, keyless entry and start, reversing camera and 17-inch alloy wheels. It also includes the Kids Pack as standard, which includes rear side window sun blinds and mirror to keep an eye on the back seat. Exclusive+ adds radar cruise control, blind-spot monitoring, panoramic sunroof, electric massage system on the driver's seat, front parking sensors, park-assist and a powered tailgate. The 113bhp e-HDi diesel is expected to be the best seller in the UK, and we reckon it delivers impressively flexible performance, so you don't have to work the engine hard to make decent progress. The 154bhp THP petrol engine is a punchy performer, too. There's also a 118bhp 1.6 petrol, while a 91bhp 1.6 diesel completes the line-up. This 91bhp diesel is particularly economical and has CO2 emissions of just 98g/km. Despite the extra power, the e-HDi 115 is almost as efficient, with emissions of 104g/km and average economy of 70.6mpg with the automatic gearbox. A 148bhp Blue HDi engine will be introduced in early 2014. The C4 Picasso is on sale now.